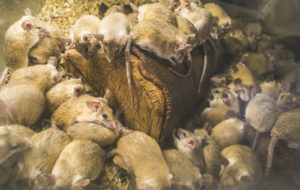 A rat infestation is a very dangerous risk for any home or business owner. This type of pest is often hard to detect, especially when their population is small. If there is already evidence of a rat infestation in your home, chances are good you need to take immediate action to overcome this risk. What Are the Dangers of Having Rats in Your Home? There are many reasons you should take action right away to overcome a rat infestation, with the most important one being that these types of animals can carry many kinds of diseases. This includes diseases that are potentially deadly to humans such as rat bite fever and hantavirus and listeria. What Can We Do About a Rat Infestation? Here at Critter Control® Miami, we offer a 4 step exclusion process to get pesky rats out of your home and keep them out for good. Inspect– After you set up your free consultation, we’ll send a technician out to your home to assess how bad the infestation is. Remove– Next, we’ll work with you to come up with a plan that best suits your needs and then needs of your home. We have a variety of ways to remove rats from your home, and we’ll always pick the most efficient option for you. Repair- Not only will we remove the rats, but we’ll clean up any messes they left behind. This includes damage to the infrastructure of your home, damaged insulation, or frayed wires. Exclude- Finally, we’ll comb through your home in search of all the entrance points the rats made and seal them up, making sure you never have to deal with an infestation again. At Critter Control® Miami, we offer outstanding support and service for those who are experiencing a rat infestation. Our goal is to properly trap and exterminate rats so they are no longer a risk to you or your family. So if you’re ready to keep those rats out of your home for good, schedule a free consultation with us at 305-258-3587.